Samsung has announced that they are reaching out to developers on the android market to improve existing applications to work with the higher resolution screen in their newest product, the Galaxy Tab. Samsung also say that soon the tablet will be receiving Android 3.0 Gingerbread which should be better suited to 3D gaming and have a more tablet friendly user interface. 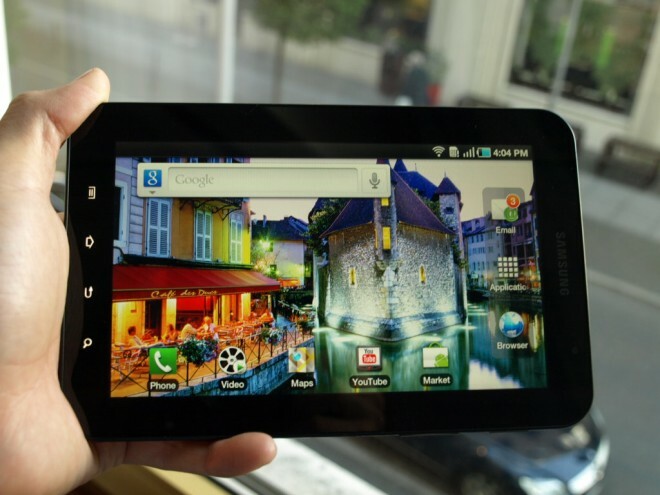 The Samsung Galaxy Tab is an interesting prospect and really a first of it’s kind. Non news-worthy Android tablets have been rolling out from cheap no-name manufacturers like Augen quite frequently and have always been missing access to applications on the market. The android market has been unavailable on tablets because of Google’s restrictions on non-smartphone devices and non native resolutions such has the Tab’s. It however is certified by Google and comes with Google applications like Gmail, Maps & Navigation, Android Market, Youtube and more. Developers will be able to make use of the superior screen resolution to make their games visually impressive and really making use of that Hummingbird. Using a higher resolution 1024×600 screen the Tab’s is similar in PPI but bigger screen size over the Droid devices running at 854×480. It has Hummingbird as its System on a Chip (SoC) which it shares with the Hummingbird. It’s currently unclear whether this will be competitive with the next generation of mobile CPUs from Qualcomm and TI who are expected to have dual core CPUs for new tablet devices launching in 5 to 7 months. It’s a good time to be a gadget nerd. First, the possibly already outdated problem. Electronics move quickly and in this case too quickly. The need for these tablets isn’t great enough to justify actually buying the Tab when much more capable devices are coming very soon, will likely last longer on a charge, and probably be of a higher build quality if it’s a competitor from Motorola or HTC. However if your looking for Android scaled up to a bigger screen, and likely an early update to Gingerbread then other tablets this is certainly a great device. I think this device has great potential to expand gaming on the Galaxy S line of phones as well as bring the more immersive experiences that can only be had on the tablet. I think we’ll actually see Galaxy specific games on the market. They share the Hummingbird architecture and are much more capable than most current games on the platform require.The higher resolution screen and promise of Gingerbread would earn it developer interest and expand gaming for the whole Galaxy line. Personally I would like to see some kind of competition between Samsung and it’s Galaxy tablet against a Motorola built Droid tablet to finish off my year but I’m not so certain that’s the holiday competition we’ll be seeing this year.